One of those recipes that makes the perfect dessert when you are looking for something light. Cooks tip: Chocolate dessert cups are available from selected supermarkets and delicatessens. Or serve in martini or wine glasses. Place chocolate and ¼ cup cream in a medium size heat proof bowl; place over simmering water, stirring occasionally, until smooth. Remove from heat. Reserve 250g strawberries for topping. Place remainder in a food processor along with icing sugar and liqueur; process until pureed. Gradually stir into chocolate mixture. Combine gelatine and water in a small glass jug or bowl. Fill sink about 2cm deep with boiling water; stand jug or bowl in sink and stir until gelatine dissolves. Stir into strawberry mixture. Refrigerate, stirring occasionally, for about 30 minutes or until just starting to thicken. Beat remaining cream until thick. Whisk ¼ of the cream into the strawberry mixture, and then fold in remainder. Place chocolate cups on a tray. Divide strawberry mixture between cups and refrigerate for about 3 hours or until set (once set, the pots can be stored in the fridge, loosely covered with cling-wrap for up to 24 hours). Just before serving, slice reserved strawberries and place in a bowl. Add extra icing sugar and extra liqueur; stir gently. Set aside for about 3 minutes. 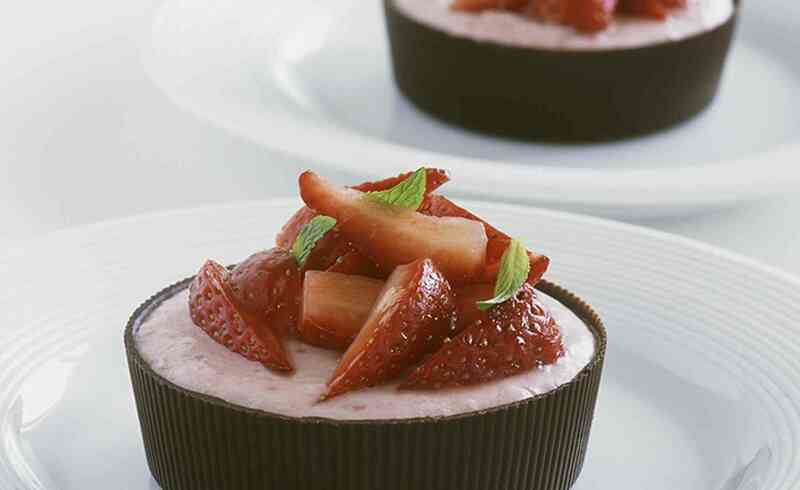 Top mousse with strawberries and garnish with mint leaves.